Cheers to Spring with a Dreamsicle Margarita. 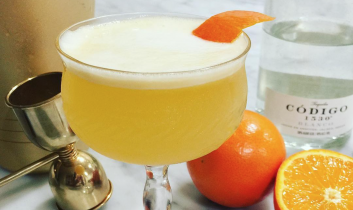 With Honeybells still in season and oh-sooooo juicy, it seemed an ideal time to shake up a Dreamsicle Margarita. If you want to try at home you will be so pleased you took the time to mix this refreshing, nostalgic treat up. Mix ingredients in a large cocktail shaker over ice. Shake vigorously (this means REALLY shake it) you want to create a beautiful foam on top. Strain into coup glass and garnish with orange peel.